Over the course of the last few weeks, there seems to be a rash of high profile Rolex thefts around the globe. Either the media is capturing these instances better, or there is a rise in large-scale Rolex thefts. Sharing these stories illustrates the lengths or opportunities people take to get a Rolex watch. Earlier in September, Bahraini police officials with cooperation from Interpol arrested a gang of what they discovered were three men who were dressed as women. Bahraini authorities arrested these men after their larger gang of six broke into the City Centre Mall after closing time, attacking a guard and making off with 79 watches valued at 1.4million. 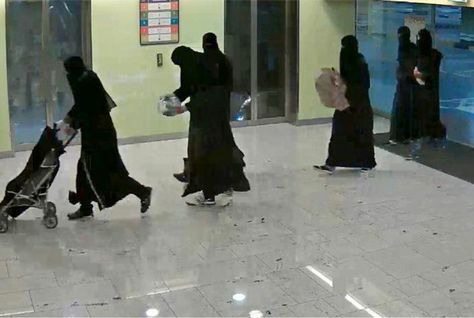 The men wore Islamic abayas throughout the theft. Three others involved in the heist are still at large. Interpol highlighted the value of interagency and international cooperation. Last week in Paris, 15 men carrying axes and sledgehammers burst into a watch store in the heart of downtown in broad daylight making off with a watch cache worth well over $100,000 euros. Two well-dressed men entered the establishment near Place Vendome. Once the two well-dressed men were allowed entrance, six others stormed in wearing hoods and armed with sledgehammers and axes. The thieves smashed shop windows and left with 20 high priced watches. Six accomplices standing outside the showroom ignited smoke grenades to allow the thieves a speedy escape on foot. Two of the men were caught, but the others are at large making the officials question the effectiveness of the surveillance cameras that monitor the strip of watch stores in Place Vendome. In a piece of hopeful good news, the High Court in Glasgow heard testimony of an earlier strong-arm theft of 400,000 pounds of watches. Three men brandished hammers and held store staff at bay with a machete. The storeowner, her husband, and five other employees, and two customers were witnesses of the event. Hopefully when the trial concludes, these men will be locked away. Other watch thefts are not as high profile, but illustrate that people do notice Rolex watches even without mentioning it. Red Oak Trail resident outside of Athens Georgia reported her $40,000 Rolex was stolen while she was spending several days in the hospital. During her hospital stay, she hid the watch inside of a shoe she placed in a drawer. She realized it was missing after she returned a few days later. A Sotheby’s realtor in Birmingham reported his vintage Tudor Submariner was stolen while he was out. Police are questioning the office’s cleaning crew. Just keep these stories in mind when visiting a watch establishment or when looking for a place to store your Rolex and shows an advantage of purchasing Rolex online at Beckertime.